Some of the best ways to learn about a country is to study their mythology and folklore. Below are a few of France’s most popular myths and legends. The Song of Roland is the oldest surviving major work of French Literature, with several manuscripts dating back to the 12th, 13th, and 14th centuries surviving today. The fact that so many versions of this story have survived for so long is a testament to it’s tremendous and enduring popularity 600-800 years ago. The Song of Roland is an epic poem based on the Battle of Roncevaux in 778, during the reign of Charlemagne. It is estimated that the poem was written around the year 1040, with alterations and additions being made unto around 1115. The final version contains around 4,000 lines of poetry and is the first and one of the most outstanding examples of the chanson de geste (songs of heroic deeds), a literary style that was incredibly popular between the 11th and 15th centuries and celebrated legendary deeds. The Song of Roland is considered a part of the much larger “French Matter,” a series of such poems that tell of the heroic deeds of French kings, some real like Charlemange, but with made up stories attributed to them, and some fictional. A modern translation can be found here. The story was also adapted by Stephen King, in his epic Dark Tower-series, in which the hero, Roland Deschain, battles to save the Dark Tower from the Crimson King. Lancelot, the Knight of the Cart Lancelot, le Chevalier de la Charrette is an Old French (meaning a version of French from long, long ago) poem by Chrétien de Troyes. No one knows exactly when the poem was written, only that it was between 1175 and 1181 (most likely 1177). During that time period, the British stories of King Arthur were very popular throughout Europe. This story, written by a Frenchman, was the first to include Lancelot (who later became one of the most important characters in the Arthurian legends). The story tells about the abduction of Queen Guinevere, and is the first to feature the love affair between Lancelot and Guinevere (which became an important part of Arthur lore). Chrétien de Troyes’ stories had a tremendous impact on future Arthur stories and on literature as a whole. 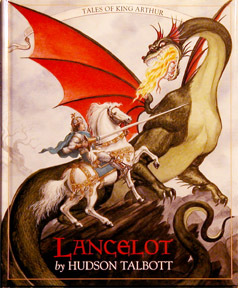 Here’s a link to put these Lancelot stories on your Kindle/Nook or to read it online. 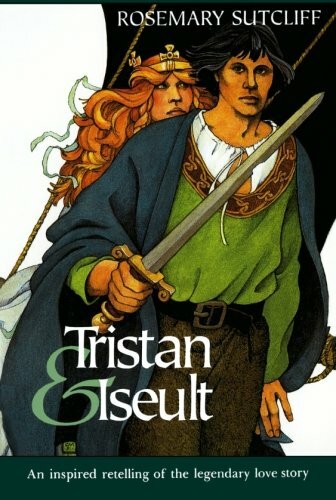 Tristan and Iseult is a medieval French story told in poem form that was popular during the 12th century. The tale was inspired by Celtic legend (ancient people that lived in Northern Europe) and possibly an 11th century Persian story called Vis and Rāmin. Tristand and Iseult has become influential as both a romance and a tragedy, retold in many ways with many variations. The story is the tragic tale of the adulterous love between the Cornish (Southern England) knight Tristan (sometimes Tristram) and the Irish princess Iseult (sometimes Isolde, Yseult, or a few other spellings). The story came long before the story of Lancelot and Guinevere, and probably inspired that one. Tristan and Iseult has had a tremendous impact on art and literature, as well as the idea of romantic love. In the 1970s, Rosemary Sutcliff, a British children’s author, rewrote the story for modern audiences. Beauty and the Beast La Belle et la Bête is a traditional fairy tale first written by French author Gabrielle-Suzanne Barbot de Villeneuve in the 1740s. Villeneuve’s version of the story was over 100 pages long and differed greatly from the story we know today, featuring a Beast character that was genuinely savage and stupid (like a true beast), not just a man with a change in appearance. In 1756, Jeanne-Marie Leprince de Beaumont, another French author, shortened the story and it became much more like the one we tell in modern times. Villeneuve’s version is much more complex than Beaumont’s. Her story gets into the past of both Bell and the Beast, making the Beast a much more sympathetic character, while Belle’s background reveals that she’s the daughter of a king and a good fairy. When she retold the story, Beaumont simplified it a great deal, getting rid of many extra characters and side plots. You can read the Beaumont version or the Villeneuve version (or what is really simple English translations of them), but personally, I found it really interesting to read both and compare the two. 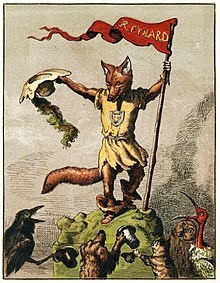 Reynard the Fox is the main character in a series of French, Dutch, English, and German fables. These fables were meant as both allegory and satire, poking fun at other medieval literature like stories of courtly love (both Tristand and Lancelot) and epic heroes like Roland or Arthur. The stories are about Reynard, an anthropomorphic fox and trickster (common in folklore and mythology (Native American coyote and the Norse god Loki are good examples of tricksters). Tricksters are not typically good or bad, instead, they have adventures that involve deceiving other characters (other animals in these stories) for his own gain, revenge, or malice, or trying to avoid retaliations from his actions. Reynard’s main victim and enemy the wolf Isengrim, Reynard’s uncle. The character appears in stories for centuries after the originals, but the core stories were written during the middle ages by multiple authors as parodies of popular literature of the time. You can read English versions of some of the original stories, or you can read a modern re-telling of the tales. Personally, I enjoyed reading both.